External factors can influence the cell cycle by inhibiting or initiating cell division. The death of nearby cells and the presence or absence of certain hormones can impact the cell cycle. The release of growth-promoting hormones, such as HGH, can initiate cell division, and a lack of these hormones can inhibit cell division. Cell growth initiates cell division because cells must divide as the surface-to-volume ratio decreases; cell crowding inhibits cell division. Key conditions must be met before the cell can move into interphase. Unlike the life of organisms, which is a straight progression from birth to death, the life of a cell takes place in a cyclical pattern. Each cell is produced as part of its parent cell. When a daughter cell divides, it turns into two new cells, which would lead to the assumption that each cell is capable of being immortal as long as its descendants can continue to divide. However, all cells in the body only live as long as the organism lives. Some cells do live longer than others, but eventually all cells die when their vital functions cease. Most cells in the body exist in the state of interphase, the non-dividing stage of the cell life cycle. When this stage ends, cells move into the dividing part of their lives called mitosis. Both the initiation and inhibition of cell division are triggered by events external to the cell when it is about to begin the replication process. An event may be as simple as the death of a nearby cell or as sweeping as the release of growth-promoting hormones, such as human growth hormone (HGH). A lack of HGH can inhibit cell division, resulting in dwarfism, whereas too much HGH can result in gigantism. Crowding of cells can also inhibit cell division. Another factor that can initiate cell division is the size of the cell; as a cell grows, it becomes inefficient due to its decreasing surface-to-volume ratio. The solution to this problem is to divide. 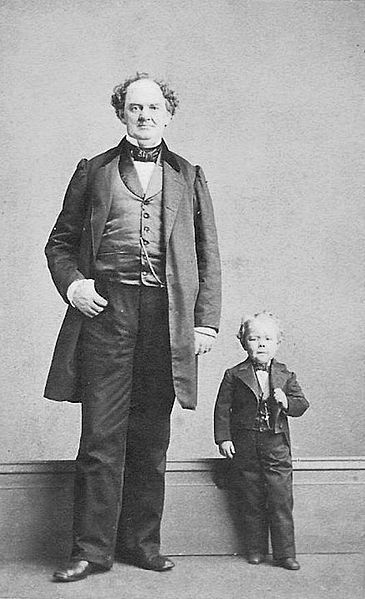 Dwarfism: Commodore Nut (right) was a famous circus performer afflicted with dwarfism. This was a result of a lack of Human Growth Hormone. The cell cycle is controlled by three internal checkpoints that evaluate the condition of the genetic information. A checkpoint is one of several points in the eukaryotic cell cycle at which the progression of a cell to the next stage in the cycle can be halted until conditions are favorable. Damage to DNA and other external factors are evaluated at the G1 checkpoint; if conditions are inadequate, the cell will not be allowed to continue to the S phase of interphase. The G2 checkpoint ensures all of the chromosomes have been replicated and that the replicated DNA is not damaged before cell enters mitosis. The M checkpoint determines whether all the sister chromatids are correctly attached to the spindle microtubules before the cell enters the irreversible anaphase stage. It is essential that the daughter cells are exact duplicates of the parent cell. Mistakes in the duplication or distribution of the chromosomes lead to mutations that may be passed forward to every new cell produced from an abnormal cell. To prevent a compromised cell from continuing to divide, internal control mechanisms operate at three main cell cycle checkpoints. A checkpoint is one of several points in the eukaryotic cell cycle at which the progression of a cell to the next stage in the cycle can be halted until conditions are favorable (e.g. the DNA is repaired). These checkpoints occur near the end of G1, at the G2/M transition, and during metaphase. Internal Checkpoints During the Cell Cycle: The cell cycle is controlled at three checkpoints. The integrity of the DNA is assessed at the G1 checkpoint. Proper chromosome duplication is assessed at the G2 checkpoint. Attachment of each kinetochore to a spindle fiber is assessed at the M checkpoint. The G1 checkpoint determines whether all conditions are favorable for cell division to proceed. The G1 checkpoint, also called the restriction point (in yeast), is a point at which the cell irreversibly commits to the cell division process. External influences, such as growth factors, play a large role in carrying the cell past the G1 checkpoint. The cell will only pass the checkpoint if it is an appropriate size and has adequate energy reserves. At this point, the cell also checks for DNA damage. A cell that does not meet all the requirements will not progress to the S phase. The cell can halt the cycle and attempt to remedy the problematic condition, or the cell can advance into G0 (inactive) phase and await further signals when conditions improve. If a cell meets the requirements for the G1 checkpoint, the cell will enter S phase and begin DNA replication. This transition, as with all of the major checkpoint transitions in the cell cycle, is signaled by cyclins and cyclin dependent kinases (CDKs). Cyclins are cell-signaling molecules that regulate the cell cycle. 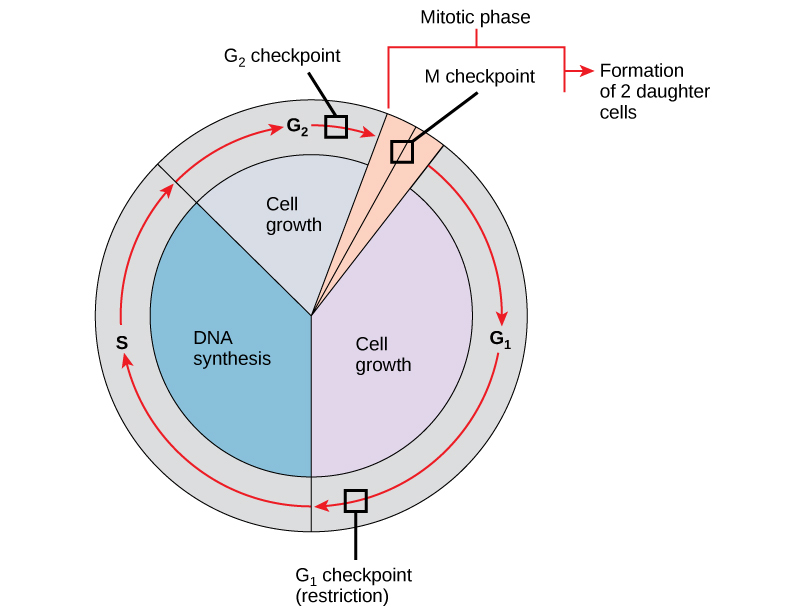 The G2 checkpoint bars entry into the mitotic phase if certain conditions are not met. As with the G1 checkpoint, cell size and protein reserves are assessed. However, the most important role of the G2 checkpoint is to ensure that all of the chromosomes have been accurately replicated without mistakes or damage. If the checkpoint mechanisms detect problems with the DNA, the cell cycle is halted and the cell attempts to either complete DNA replication or repair the damaged DNA. If the DNA has been correctly replicated, cyclin dependent kinases (CDKs) signal the beginning of mitotic cell division. The M checkpoint occurs near the end of the metaphase stage of mitosis. The M checkpoint is also known as the spindle checkpoint because it determines whether all the sister chromatids are correctly attached to the spindle microtubules. Because the separation of the sister chromatids during anaphase is an irreversible step, the cycle will not proceed until the kinetochores of each pair of sister chromatids are firmly anchored to at least two spindle fibers arising from opposite poles of the cell. The cell cycle is controlled by regulator molecules that either promote the process or stop it from progressing. Two groups of proteins, cyclins and cyclin-dependent kinases (Cdks), are responsible for promoting the cell cycle. Cyclins regulate the cell cycle only when they are bound to Cdks; to be fully active, the Cdk/cyclin complex must be phosphorylated, which allows it to phosphorylate other proteins that advance the cell cycle. Negative regulator molecules (Rb, p53, and p21) act primarily at the G1 checkpoint and prevent the cell from moving forward to division until damaged DNA is repaired. p53 halts the cell cycle and recruits enzymes to repair damaged DNA; if DNA cannot be repaired, p53 triggers apoptosis to prevent duplication. Production of p21 is triggered by p53; p21 halts the cycle by binding to and inhibiting the activity of the Cdk/cyclin complex. 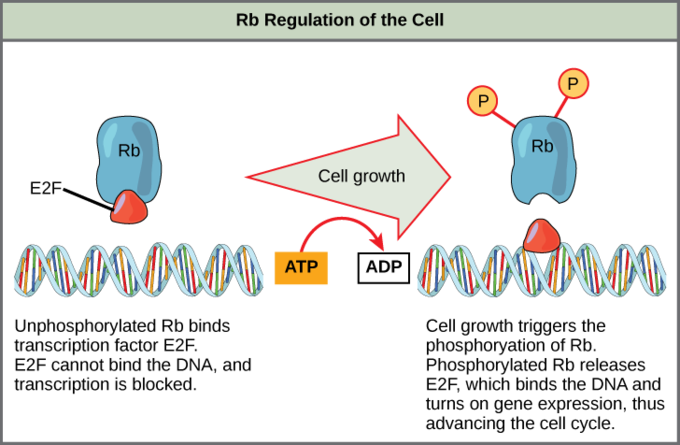 Dephosphorylated Rb binds to E2F, which halts the cell cycle; when the cell grows, Rb is phosphorylated and releases E2F, which advances the cell cycle. In addition to the internally controlled checkpoints, there are two groups of intracellular molecules that regulate the cell cycle. These regulatory molecules either promote progress of the cell to the next phase (positive regulation) or halt the cycle (negative regulation). Regulator molecules may act individually or they can influence the activity or production of other regulatory proteins. Therefore, the failure of a single regulator may have almost no effect on the cell cycle, especially if more than one mechanism controls the same event. Conversely, the effect of a deficient or non-functioning regulator can be wide-ranging and possibly fatal to the cell if multiple processes are affected. Cyclin Concentrations at Checkpoints: The concentrations of cyclin proteins change throughout the cell cycle. There is a direct correlation between cyclin accumulation and the three major cell cycle checkpoints. Also, note the sharp decline of cyclin levels following each checkpoint (the transition between phases of the cell cycle) as cyclin is degraded by cytoplasmic enzymes. Cyclins regulate the cell cycle only when they are tightly bound to Cdks. To be fully active, the Cdk/cyclin complex must also be phosphorylated in specific locations. Like all kinases, Cdks are enzymes (kinases) that phosphorylate other proteins. Phosphorylation activates the protein by changing its shape. The proteins phosphorylated by Cdks are involved in advancing the cell to the next phase.. 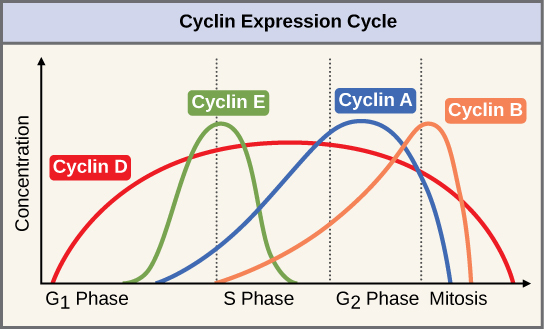 The levels of Cdk proteins are relatively stable throughout the cell cycle; however, the concentrations of cyclin fluctuate and determine when Cdk/cyclin complexes form. The different cyclins and Cdks bind at specific points in the cell cycle and thus regulate different checkpoints. Activation of Cdks: Cyclin-dependent kinases (Cdks) are protein kinases that, when fully activated, can phosphorylate and activate other proteins that advance the cell cycle past a checkpoint. 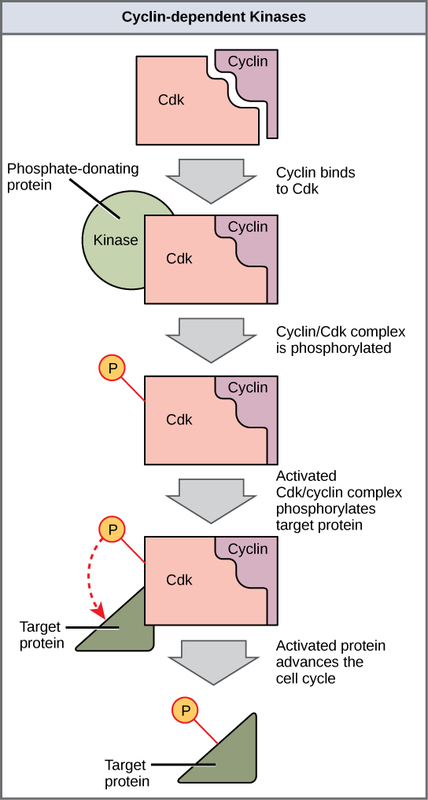 To become fully activated, a Cdk must bind to a cyclin protein and then be phosphorylated by another kinase. Although the cyclins are the main regulatory molecules that determine the forward momentum of the cell cycle, there are several other mechanisms that fine tune the progress of the cycle with negative, rather than positive, effects. These mechanisms essentially block the progression of the cell cycle until problematic conditions are resolved. Molecules that prevent the full activation of Cdks are called Cdk inhibitors. Many of these inhibitor molecules directly or indirectly monitor a particular cell cycle event. The block placed on Cdks by inhibitor molecules will not be removed until the specific event being monitored is completed. The best understood negative regulatory molecules are retinoblastoma protein (Rb), p53, and p21. Retinoblastoma proteins are a group of tumor-suppressor proteins common in many cells. Much of what is known about cell cycle regulation comes from research conducted with cells that have lost regulatory control. All three of these regulatory proteins were discovered to be damaged or non-functional in cells that had begun to replicate uncontrollably (became cancerous). In each case, the main cause of the unchecked progress through the cell cycle was a faulty copy of the regulatory protein. Rb, p53, and p21 act primarily at the G1 checkpoint. p53 is a multi-functional protein that has a major impact on the cell’s commitment to division; it acts when there is damaged DNA in cells that are undergoing the preparatory processes during G1. If damaged DNA is detected, p53 halts the cell cycle and recruits enzymes to repair the DNA. If the DNA cannot be repaired, p53 can trigger apoptosis (cell suicide) to prevent the duplication of damaged chromosomes. As p53 levels rise, the production of p21 is triggered. p21 enforces the halt in the cycle dictated by p53 by binding to and inhibiting the activity of the Cdk/cyclin complexes. As a cell is exposed to more stress, higher levels of p53 and p21 accumulate, making it less likely that the cell will move into the S phase. 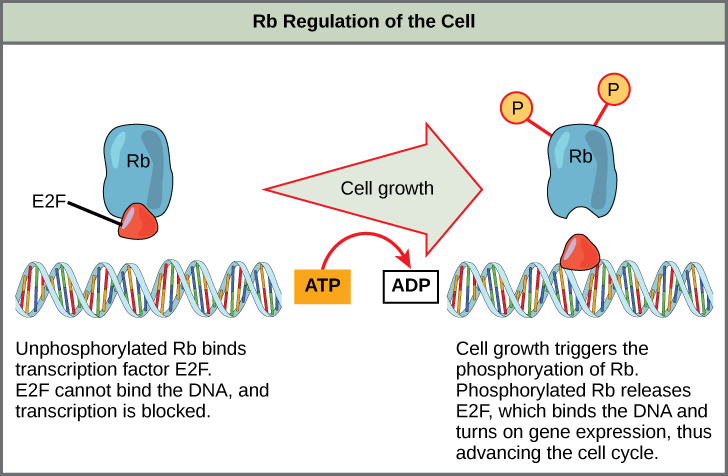 Function of the Rb Regulator Molecule: Rb halts the cell cycle by binding E2F. Rb releases its hold on E2F in response to cell growth to advance the cell cycle.